Gliders or Sailplanes are heavier-than-air aircraft primarily intended for unpowered flight. See also gliding and motor gliders for more details. A "glider" is an unpowered aircraft. The most common types of glider are today used for sporting purposes. The design of these types enables them to climb using rising air and then to glide for long distances before finding the next source of lift. This has created the sport of gliding, or soaring. The term "sailplane" is sometimes used for these types, implying a glider with a high soaring performance. In addition to high-performance sailplanes, the term 'glider' also encompasses hang gliders and paragliders. Like sailplanes these can use upwardly moving air to soar but differ in not having a fuselage, control surfaces or a control column. Descriptions of these variants are in separate articles and so the rest of this article is only about conventional gliders and sailplanes. Although many gliders do not have engines, there are some that use engines occasionally (see Motor glider). The manufacturers of high-performance gliders now often list an optional engine and a retractable propeller that can be used to sustain flight if required; these are known as 'self-sustaining' gliders. Some can even launch themselves and are known as 'self-launching' gliders. There are also 'touring motor gliders', which can switch off their engines in flight though without retracting their propellers. 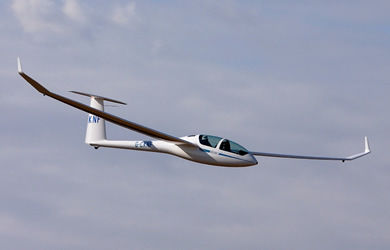 The term "pure glider" (or equivalently, but less commonly "pure sailplane") may be used to distinguish a totally unpowered glider from a motorized glider, without implying any differential in gliding or soaring performance. In China, kites rather than gliders were used for military reconnaissance. However the Extensive Records of the Taiping Era (978) suggests that a true glider was designed in the 5th century BC by Lu Ban, a contemporary of Confucius. There is also a report from the History of Northern Dynasties (659) and Zizhi Tongjian (1084) that Yuan Huangtou in Ye made a successful glide, taking off from a tower in 559. Abbas Ibn Firnas invented the first weight shift aircraft (hang glider) and is also claimed as the inventor of the first manned glider in 875 by fixing feathers to a wooden frame fitted to his arms or back. Written accounts at the time suggest that he made a ten minute flight. Abbas was seriously injured in the resulting crash. Otto Lilienthal in flightThe first heavier-than-air (i.e. non-balloon) aircraft to be flown in Europe was Sir George Cayley's series of gliders which achieved brief wing-borne hops from around 1804. Santos Dumont, Otto Lilienthal, Percy Pilcher, John J. Montgomery, and the Wright Brothers are other pioneers who built gliders to develop aviation. After the First World War gliders were built for sporting purposes in Germany (See link to Rhön-Rossitten Gesellschaft) and in the United States (Schweizer brothers). The sporting use of gliders rapidly evolved in the 1930s and is now the main application. As their performance improved gliders began to be used to fly cross-country and now regularly fly hundreds or even thousands of kilometers in a day, if the weather is suitable. Military gliders were then developed by a number of countries, particularly during World War II, for landing troops. A glider was even built secretly by POWs as a potential escape method at Oflag IV-C near the end of the war in 1944. The space shuttle orbiters do not use their engines after re-entry at the end of each spaceflight, and so land as gliders. The two most common methods of launching gliders are by aerotow and by winch. When aerotowed, the glider is towed behind a powered aircraft using a rope about 60 meters (about 200 ft) long. The glider's pilot releases the rope after reaching the desired altitude, but the rope can also be released by the towplane in an emergency. Winch launching uses a powerful stationary engine located on the ground at the far end of the launch area. The glider is attached to one end of 800-1200 metres (about 2,500-4,000 ft) of wire cable and the winch then rapidly winds it in. More rarely, powerful automobiles are used to pull gliders into the air, by pulling them directly or through the use of a pulley in a similar manner to the winch launch. Elastic ropes can also be used to launch gliders off slopes if there is sufficient wind blowing up the hill. The glider will then gain height using ridge lift. The most commonly used source of lift is created by the Sun's energy heating the ground which in turn heats the air above it. This warm air rises in columns known as thermals. Soaring pilots quickly become aware of visual indications of thermals such as: cumulus clouds, cloud streets, dust devils and haze domes. Also, nearly every glider contains an instrument known as a variometer (a very sensitive vertical speed indicator) which shows visually (and often audibly) the presence of lift and sink. Having located a thermal, a glider pilot will circle within the area of rising air to gain height. In the case of a cloud street thermals can line up with the wind creating rows of thermals and sinking air. A pilot can use a cloud street to fly long straightline distances by remaining in the row of rising air. Another form of lift occurs when the wind meets a mountain, cliff or hill. The air is deflected up the windward face of the mountain forming lift. Gliders can climb in this rising air by flying along the feature. This is referred to as "ridge running" and has been used to set record distance flights along the Appalachians in the USA and the Andes Mountains in South America. Another name for flying with ridge lift is slope soaring. Gusts and wind-shear have been used by the flyers of models, but these phenomena are almost always too close to the ground to be useful to glider-pilots. Among the more exotic forms of lift is the phenomenon known as Morning Glory which is used by some glider pilots in Australia. It had also been hoped to use the polar vortex in the Perlan Project to soar to great altitudes. After climbing in lift, gliders move on to find the next source of lift, or to land. As the glider descends, the air moving over the wings generates lift. The lift force acts slightly forward of vertical because it is created at right angles to the airflow which comes from slightly below as the glider descends, see Angle of attack. This horizontal component of lift is enough to overcome drag and allows the glider to accelerate forward. The ratio of lift to drag is the same as the height lost for each metre of forward travel, Glide ratio. With each generation of materials and with the improvements in aerodynamics, the performance of gliders has increased. One measure of performance is the glide ratio. A ratio of 30:1 means that in smooth air a glider can travel forward 30 meters while only losing 1 meter of altitude. Comparing some typical gliders that might be found in the fleet of a gliding club - the Grunau Baby from the 1930s had a glide ratio of just 17:1, the glass-fiber Libelle of the 1960s increased that to 39:1, and nowadays flapped 18 meter gliders such as the ASG29 have a glide ratio of over 50:1. The largest open-class glider, the eta, has a span of 30.9 meters and has a glide ratio over 70:1. Compare this to the infamous Gimli Glider, a Boeing 767 which ran out of fuel mid-flight and was found to have a glide ratio of only 12:1, or to the Space Shuttle with a glide ratio of 3:1. A glider releasing its water ballastModern competition gliders are also designed to carry jettisonable water ballast (in the wings and sometimes in the vertical stabiliser). The extra weight provided by the water ballast is advantageous if the lift is likely to be strong, and may also be used to adjust the glider's center of mass. Although heavier gliders have a slight disadvantage when climbing in rising air, they achieve a higher speed at any given glide angle. This is an advantage in strong conditions when the gliders spend only little time climbing in thermals. The pilot can jettison the water ballast before it becomes a disadvantage in weaker thermal conditions. Another use of water ballast is to dampen air turbulence such as might be encountered during ridge soaring. To avoid undue stress on the airframe, gliders must jettison any water ballast before landing. Pilots can land accurately by controlling their rate of descent using spoilers, also known as air brakes. These are metal devices which extend from either the upper-wing surface or from both upper and lower surfaces, thereby destroying some lift and creating additional drag. A wheel-brake also enables a glider to be stopped after touchdown, which is particularly important in a short field. See also the full gliders and manufacturers list, past and present. Much more than in other types of aviation, glider pilots depend on the variometer, which is a very sensitive vertical speed indicator, to measure the climb or sink rate of the plane. This enables the pilot to detect minute changes caused when the glider enters rising or sinking air masses. Both mechanical and electronic 'varios' are usually fitted to a glider. The electronic variometers produce a modulated sound of varying amplitude and frequency depending on the strength of the lift or sink, so that the pilot can concentrate on centering a thermal, watching for other traffic, on navigation, and weather conditions. Rising air is announced to the pilot as a rising tone, with increasing pitch as the lift increases. Conversely, descending air is announced with a lowering tone, which advises the pilot to escape the sink area as soon as possible. The track of a glider while thermalling in the Austrian Alps using SeeYou(C) visualization software. Like all other aircraft, gliders are required to be painted with a national aircraft registration number, known as a "tail number" or in the U.S. as an "N-number". The required size of these numbers varies from country to country. The size range is from 1 cm to 30 cm, sometimes depending on the age of the aircraft. To distinguish gliders in flight, very large numbers/letters are sometimes displayed on the fin and wings. These numbers were added for use by ground-based observers in competitions, and are therefore known as "competition numbers" or "contest ID's". 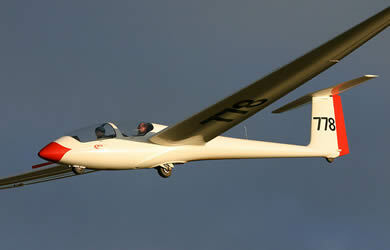 They are unrelated to the glider's registration number, and are assigned by national gliding associations. They are useful in radio communications between gliders, so glider pilots often use their competition number as their call-signs.